Every year, the day before Father's Day, the houses on my block close off the street and throw a street party. We look forward to it every year. 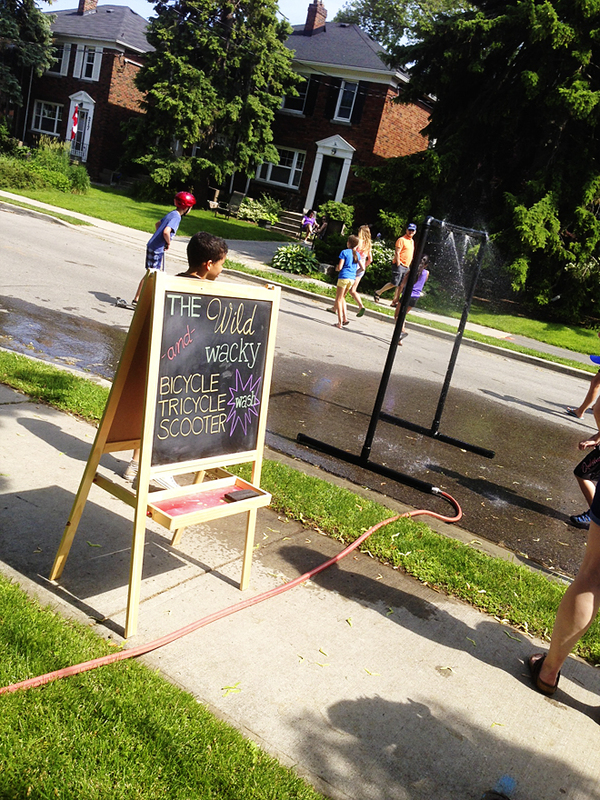 Its the one time of year when you can let your kid loose on the street, letting her zip around on her scooter, sit on neighbour's lawns, blowing bubbles, making chalk drawings, and spending the day doing all the things kids love. Having participated in these events for a number of years, I thought I would share some tips on how to host a street party of your own. Three to four months in advance, solicit your neighbours and see who is interested in helping organize the event. 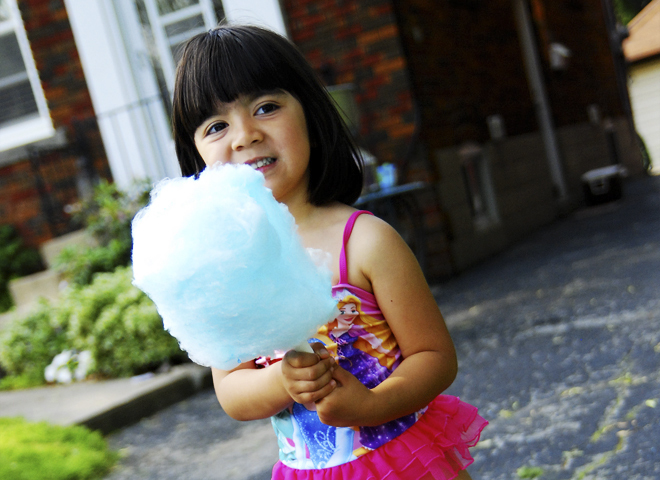 Consider free community services you can incorporate at your street party. At ours, we have a fire truck visit. The kids get to sit inside the truck, take turns holding the hose, and get wet! Its a free service (though the firemen can't guarantee they'll show up at the appointed time, if a fire happens that they need to respond to). Do some fund raising and run raffles to help defray the costs. Ask local shops to donate giveaways, gift cards, or prize baskets that you can raffle off ahead of time to raise some funds. Do a 50/50 draw (winner gets 50% of the pot, and the other 50% goes towards next year's party). Plan activities for big and little kids. The littles might like a jumpy castle while the bigger kids would love to play some basketball. Always make sure an adult is supervising the jumpy structures. You don't want this to happen. Communicate the day's agenda to your neighbours. If you are collecting fees from your neighbours to help pay for the event, knock on doors, let them know what to expect and where their money is going. Publish an agenda and put it in everyone's mailbox. Encourage people to "be" outside - set up tables and lawn chairs, put up open tents, pull out backyard play toys (water tables, play houses, toddler slides) and put them on the front lawns. 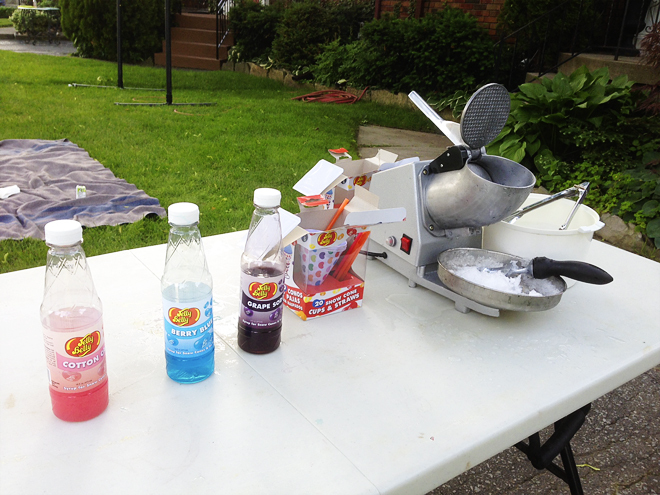 We participated more actively this year and held a few activities outside our house: a bicycle wash, and snow cone station. They were huge hits! 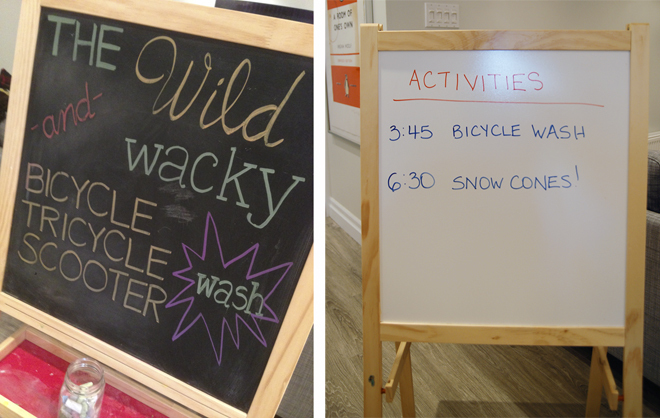 I listed the activities on Chloe's chalkboard/whiteboard which turned out to be a smart idea... the kids' excited anticipation of the activities was part of the fun! My mom had an ice crusher machine that we borrowed and we found all the snow cone accessories at Kitchen Stuff Plus. 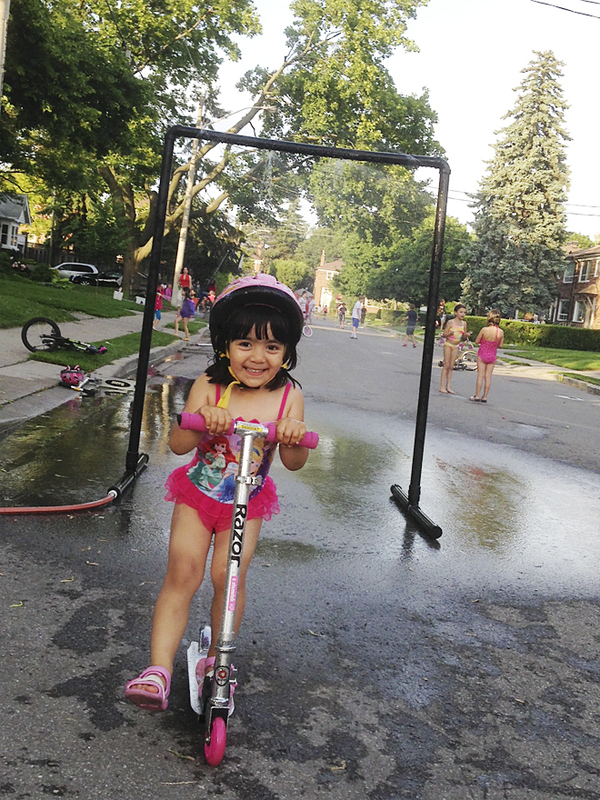 The street party was a blast - and totally worth the effort to see a smile like this on my favourite girl. 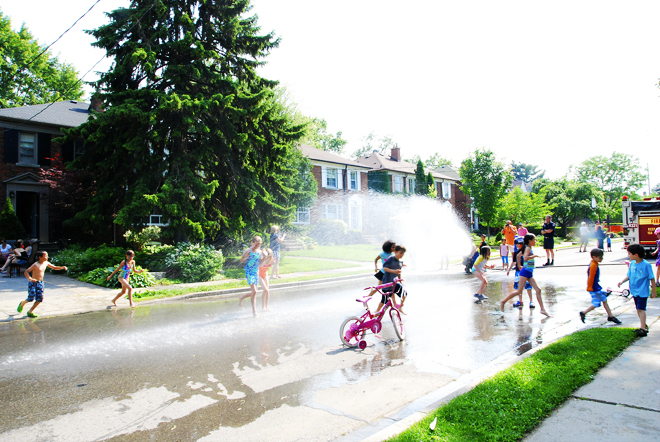 Does your neighbourhood throw a street party? What kind of activities do you do?